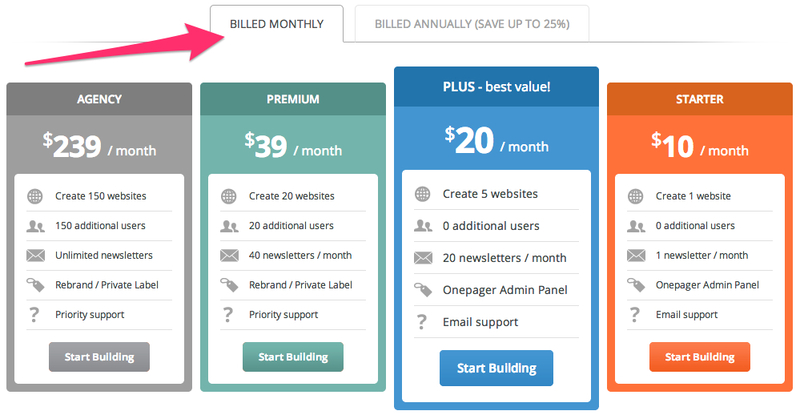 Annual and monthly billing plans are common in SaaS businesses. Monthly plans work best for short-term users who need to test a service, while annual plans work better for users who are confident they’ll be using the service for a year or longer. So how should you offer them to your customers? 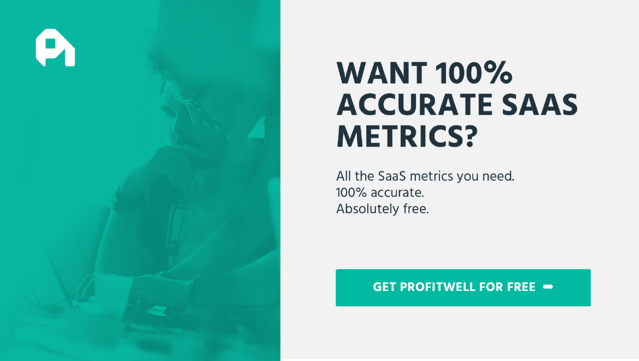 If you’ve taken a good look at our SaaS Pricing Page Blueprint eBook, you know that only 1 in 5 of the 270 SaaS companies we studied offer both monthly and annual pricing. 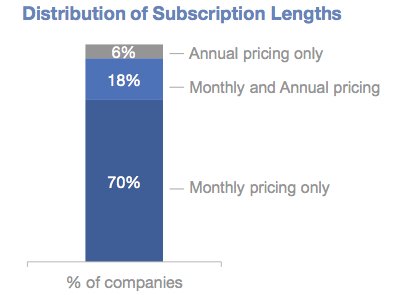 When it comes to subscription models, most companies offer monthly plans exclusively; the lower prices appear friendlier, and the lack of a heavy commitment reduces friction for new customers. Yet as long as the pricing structure isn’t too complex, a SaaS company can use both monthly and annual plans to boost revenue. Sure, monthly payments may be the lifeblood of your business, but annual subscriptions secure you more business upfront, increase cash flow, and reduce churn. Even a small percentage of larger contracts can have a huge impact on your bottom line. Compromising between the two options doesn’t have to clog up your pricing page either, which is why we’re going to examine a couple company pages that keep it simple while ensuring buyers know they can sign up for bigger deals. First, let’s dive into why annual plans and cash upfront is so important to your SaaS subscription business. 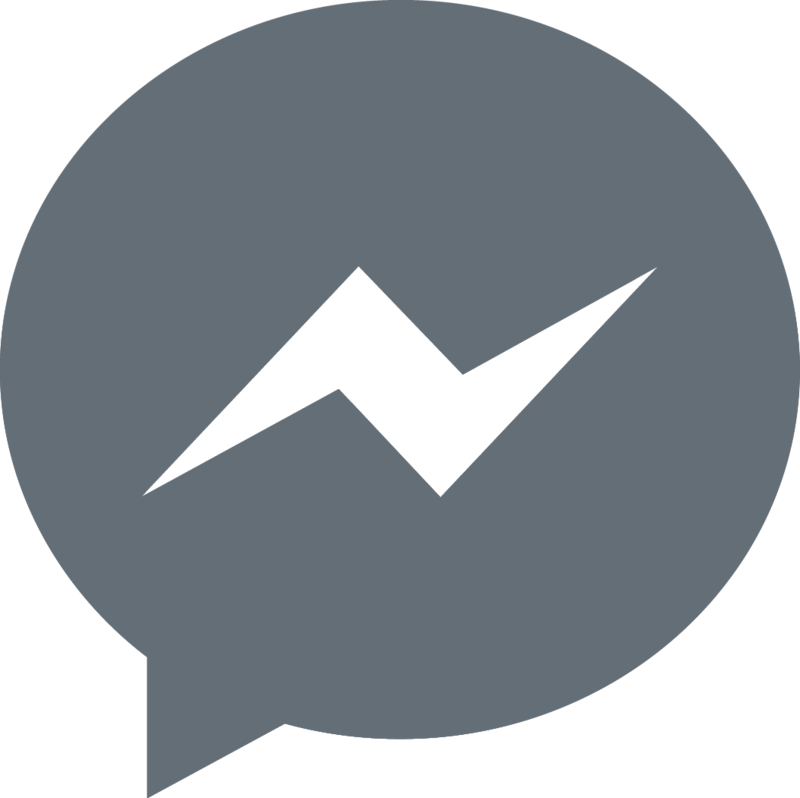 Why Should I Offer Annual Subscriptions? Customer retention is the key to profitability in SaaS, and customers who churn out can waste a considerable portion of the cash you spend to acquire them. The flexibility and lower barrier to entry of the monthly subscription is crucial for acquiring new users, but you can’t deny that if customers bail out on your service, you won’t see the cash you need to survive, let alone grow and prosper. 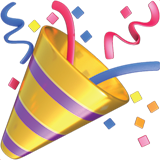 Simply put, an annual plan guarantees the customer will be around for at least 12 months. That’s a huge step up in customer lifetime value, and you’ll have more time to engage with the customer and ensure implementation of the product was successful. Annual contracts also provide an opportunity to get paid for months upfront, which will improve your cash flow and help you recover customer acquisition costs. Asking for payments in advance can be a major buzzkill for some prospects, but those who love your product might be persuaded to commit if you offer up a slight discount. What’s essential to understand is that both plans benefit your business, and offering the customer a choice won’t necessarily hurt your bookings. As long as your transparent with your pricing strategy and you have a clear way to display monthly and annual options, the flexibility will ensure you can cater to different buyers at different stages in the customer life cycle. As we mentioned above, providing more than one type of subscription doesn't have to turn your pricing page into a hot mess (as long as the pricing structure isn’t too complicated already). While the number of SaaS companies currently offering annual plans might be low, more businesses are beginning to see the advantage of using discounted annual billing alongside monthly plans at full price. One such company is Wistia, who have a gorgeous pricing page we’ve championed countless times in previous posts. From the right hand side of the page, you can click on monthly or annual pricing, and the monthly prices within each of the five paid tiers change to display the 20% discount you’ll receive if you sign up for an annual contract. The pricing is still displayed monthly, but the prices change to reveal the discount (it also says “save 20% by paying annually” above the spot where you select annual or monthly plans). What’s great about this design tactic is its simplicity – they aren’t adding much to the page, just a small switch to the right. Nothing on the page is affected except for the prices, and the customer can easily see the precise benefit of signing up for annual billing. Another example is Onepager, a company that offers a professional website building solution for small businesses. They do something very similar to Wistia, although you’ll see the discount for an annual subscription is not consistent across the board. 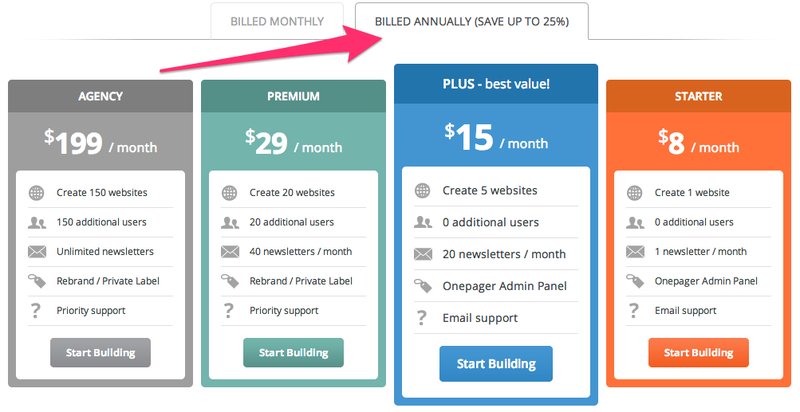 On Onepager’s pricing page, there are two tabs for monthly and annual billing directly above the tiers. If you click on the annual billing tab, the prices within the tiers change in the same way as Wistia’s - to accommodate the discount. Nothing else on the page is altered. As mentioned above, the difference is in the discount, and while the annual subscriptions for the middle tiers are discounted 25%, the lowest and highest tiers are discounted less (20% and close to 17% respectively). The annual billing tab states you can “save up to 25%,” so it’s fairly clear that not all of the plans will be discounted equally. For the record, we recommend discounting your annual subscriptions 15-20%, but it depends on your business and the price sensitivity of your customers. We’re not entirely sure how Onepager arrived at these numbers, or whether they used customer data to develop their pricing strategy, but their page definitely displays the difference in price between monthly and annual plans effectively. One click reveals the reward for loyalty and commitment, and that’s all it should take. Given the impact of providing an annual plan on your recurring revenue and SaaS metrics, you may be tempted to only offer that option. After all, Salesforce, one of the most successful SaaS companies of all time, shows you monthly prices but forces you to pay annually. While this approach is ok in theory, it may aggravate potential buyers. Onboarding new subscribers with annual contracts is also expensive, and you’ll need a proper sales team to justify the value provided in the product if you want to lock in those bigger deals. That being said, no one wants their customers to bail out after a few months either. Do what’s best for you - just make sure your pricing structure aligns with the value your customers are looking for in your service. If you have a range of customers you can serve, providing both options can be a profitable, happy medium for your business.